Looking at purchasing a home in the near future? There are a number of things to keep in mind and that is why we wanted to break it down and make it extremely easy to do when we created the Mortgage Qualification Worksheet. Although the formulas and costs will vary from state to state and company to company this will give you an overall look at the formula involved in seeing what you can potentially qualify for in regards to your total house loans and how it will break down into monthly payments. 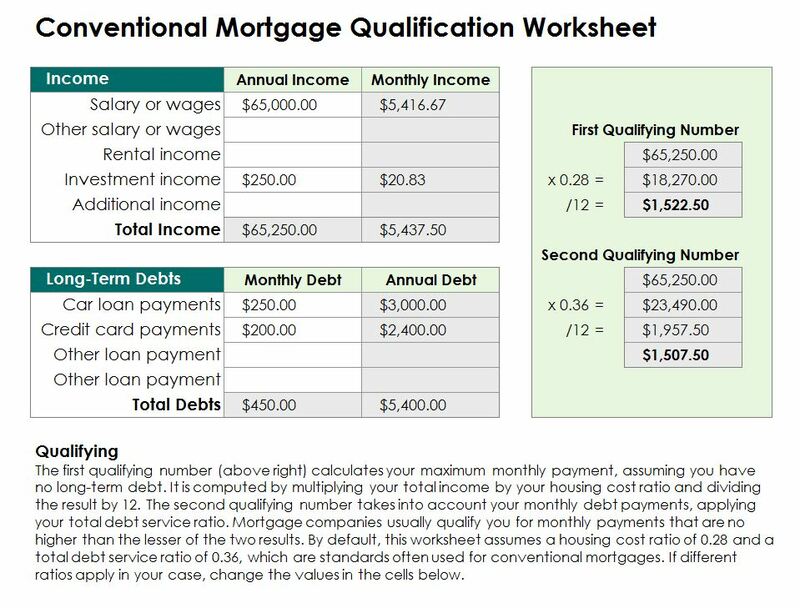 This Mortgage Qualification Worksheet is available for free and can easily be downloaded right here by clicking on the download button. Once downloaded, the Mortgage Qualification Worksheet comes preloaded with some sample numbers already plugged in. You need to adjust these to match your salary and costs. Based off this information provided it will be computed to calculate 2 variable pieces of information. The way the formula is created is well explained on the Mortgage Qualification Worksheet, but the result will give two results. First Qualifying Number is calculating your total house payment to your income and diving it by 12 (annual converted to monthly). The second Qualifying Number is focused on your debt to income ratio. These numbers are important because Mortgage Companies qualify you for no more than the lesser of the two figures. The template comes with preset figures based off normal standards for conventional mortgages. For figures that differ for the loan you are seeking this template is easily customized to adjust as to provide you more accurate results. The final result will give you a rough figure for a dollar amount that you may qualify for based off that information. The purchase of a home sometimes accrues additional costs (ie: Homeowners fees or insurance). This last section will give you a chance to plug in those figures to make sure that the monthly payments are something you can handle. Although these figures have many variables that can change it will give you a rough estimate to consider before contacting a professional lender for exact data.